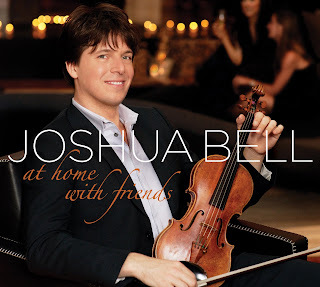 I recently received the Joshua Bell CD from One 2 One network (for free). I had not actually heard of Joshua Bell before I got this CD and listened to it. Joshua Bell is a Grammy Award-winning violinist and has over 30 original albums! Where have I been?? This isn't just your typical album with Joshua playing all instrumental violin pieces. He wanted to do something different and perform instrumental and vocal duets with some wonderful friends and musicians. The result is lovely. His beautiful violin playing combined with singers like Sting, Josh Groban and musicians such as Chris Botti makes the CD really enjoyable! I was listening to the CD again, trying to decide what my favorite song was, but I still can't decide. I love the first few songs - they give that sort of haunting sound that transports you to a far-off land. It's so relaxing to listen. I had to just sit myself down, close my eyes, and enjoy. But I also enjoy the upbeat songs and the variety of song types. I truly like this album and will not forget Joshua Bell anytime soon. This CD seems like the perfect sound for Fall and Winter, so I plan on playing it quite a bit over the next few months! In fact, this seems like a good Stop and Smell the Chocolates kind of CD, so maybe I need to sit down with a cup of tea (or glass of wine!) and some chocolate when listening to this one! You can get more info at Joshua's website and even see and hear some of the performances. You can buy the CD here. Disclosure: One 2 One Network sent me this CD for free in exchange for doing an honest review on my blog. I received no other compensation. Um I want free CD's to listen too and review. I have ears so I'm qualified! Right? Big I got nothing this morning and I'm going to go get my coffee size hugs to you! Have a glorious day my sweet friend!